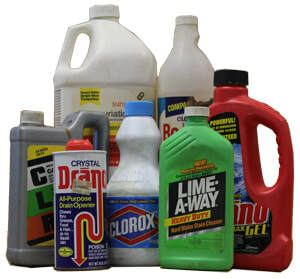 Household Hazardous Waste (HHW) are common household products that exhibit the characteristics of hazardous waste. Many of these products are very common and are usually purchased from local hardware, automotive, and grocery stores. Because these products are so common and easy to purchase, many people forget that these products can be extremely harmful to their health or the environment. If labels contain the words: “Danger,” “Poison,” or “Caution/Warning consider it hazardous waste. These should be taken to a Hazardous Waste Collection. You do not need bring any empty bottles or cans to a collection; these items should be put in with your regular trash. Safe storage of hazardous products between uses or between collections is vital to keeping your home environment healthy. Keep items out of reach of children and pets. Stacking paint cans on top of each other, especially on high shelves, can be risky. Try a lidded box to prevent access instead. Keep items away from heat sources (for safety), freezing temperatures (to prolong product life), and flood prone areas (to prevent contamination of water and soil). Paint stored upside down (with lid firmly in place!) will keep it fresher. Oil-based paint can remain usable up to 15 years if stored properly, so a little care can keep the product usable. Proper storage and disposal of hazardous waste is essential to the long-term health of Vermont's soil, air, and water. We offer multiple annual events for collection hazardous waste and other hard-to-dispose of materials from May to October. Collections are open to residents of all member towns. Fees are $20 per car load for most residential loads. Visit our Hazardous Waste Collections page to learn about upcoming events near you. We can accept paints (with the PaintCare standards) year-round at our ARCC facility, in addition to collecting them at HHW events. You can also check with your hardware store to see if they accept paint for recycling. Gasoline, kerosene, contaminated auto oil, brake fluid, transmission fluid. These should be taken to a Hazardous Waste Collection! 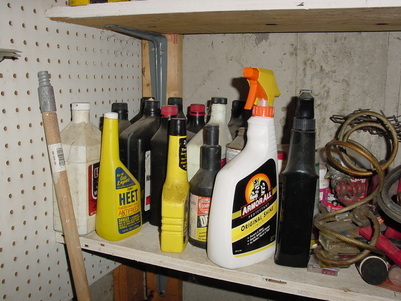 Contaminated oil products MUST go to a HHW collection event. See our Trash & Recycling Options page for facility locations and contact information. 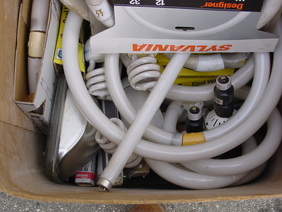 Unbroken fluorescent bulbs are also accepted year-round at some hardware stores and lighting retail stores; see fluorescent bulb recycling options for details. *If you break a fluorescent bulb, follow the Broken Bulb Guidelines from the VT Agency of Natural Resources. Mercury thermometers - Bring these to a Hazardous Waste Event. Mercury containing thermostats - We collect these year round at our office. Bring one in to get a $5 rebate coupon. If you can't do that, you can bring them to a Hazardous Waste Collection or drop them off at one of these other locations. *For more information and to learn about year round collections of mercury containing items, see VT DEC Mercury Education website. How do I reduce toxins in my home? Refuse to buy toxins! See our booklet, Non-toxic Household Cleaners, for more information on how to reduce the amount of poisonous cleaners you use. The National Institutes for Health​ has a searchable Household Products Database and is a wonderful resource for learning about specific toxic ingredients in products commonly found around the home. Learn more about reducing toxins! Check out this video from The Green Guide@Howdini.com!